The Independent Tribune bus enters Turn 4 trying to hang on to second in the Bojangles’ Summer Shootout at Charlotte Motor Speedway. 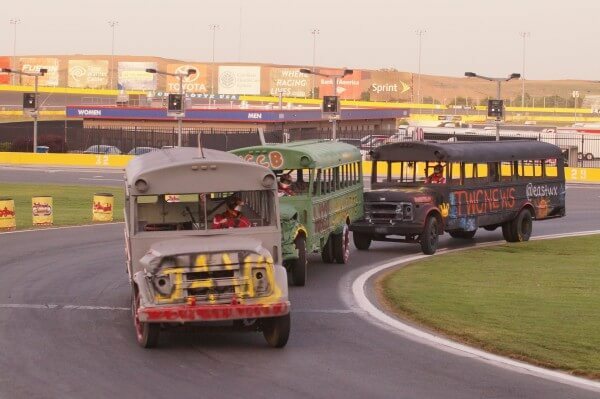 CONCORD, N.C. – Historically, rookies struggle at Charlotte Motor Speedway, but that didn’t stop first-time school bus racer Joe “Hot Wheels” Howard who ran away from the field to win the Media Mayhem School Bus Slobberknocker during Round 4 of the Bojangles’ Summer Shootout at the legendary 1.5-mile superspeedway. Ashton Higgins and Jordan Black also took home the hardware during a full night of Legend Car and Bandolero action. Howard, a producer from Charlotte-based NBC News Channel, started on the pole and fought off hard-charging veteran bus racers Chris Rozak (WEND) and Matthew East (Time Warner Cable News) to earn the Media Mayhem title. WCCB’s Brandon Davidow and the Independent Tribune’s Mark Plemmons rounded out the top five finishers. Although this race was his first behind the wheel, Howard admitted that he got some advice from co-worker and Security Force Masters division racer Herman Towe, who has also competed in several previous Media Mayhem events. 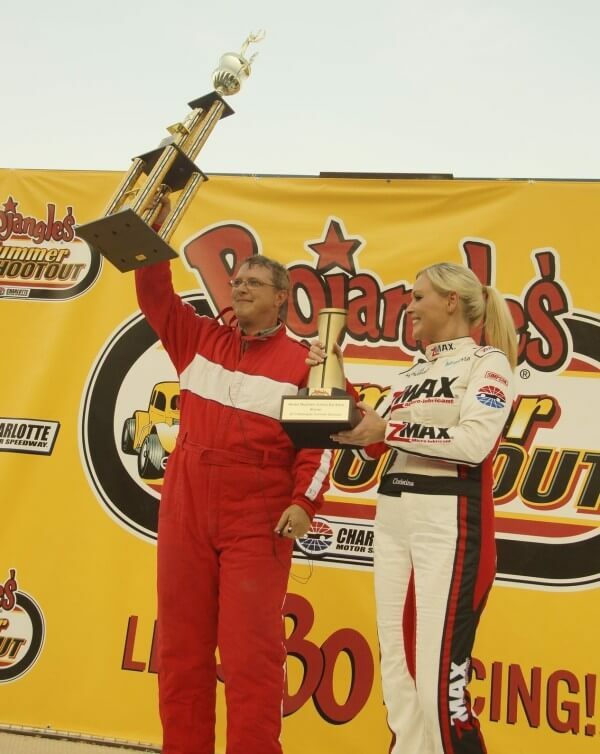 Higgins took home his third win in four rounds of Bojangles’ Summer Shootout action. With a four-wide battle for the lead on the opening lap, Higgins took charge after lap five. Even after three cautions, Higgins never lost his lead. The young driver pulled away from Blaise Brinkly and Connor Younginer, who finished second and third respectively. Black won Tuesday night’s Pro division feature, taking home his second win of the Bojangles’ Summer Shootout Series season. Joey Padgett was dominant during the first 15 laps of the race, while Black battled Dillon Faggart, Jared Irvan and Michael Torres for the second position before taking the lead from Padgett on lap 16. The race had a single caution on lap 7 when Carson Ferguson made contact with Reid Wilson and Alex Murray in Turn 4. The Bojangles’ Summer Shootout continues at Charlotte Motor Speedway on Tuesday, June 30, with the Fourth of July Fireworks Extravaganza. Fans will see fireworks of the season on and off the track at Charlotte Motor Speedway. The Tuesday night spectacular will highlight the very best Legend Car and Bandolero racers as well as feature a Champ truck display. Kick the Fourth of July holiday with Charlotte Motor Speedway with the firework extravaganza. Connect with Charlotte Motor Speedway on Twitter, Facebook and Instagram or get all the latest news and information with the Charlotte Motor Speedway mobile app. Independent Tribune photographer James Nix is working a video feature from the Media Mayhem race that will be posted later on the Independent Tribune website.